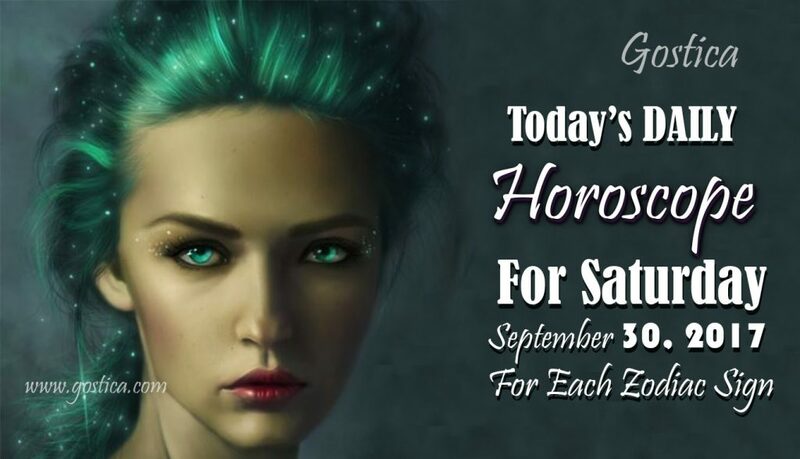 1Check out today's horoscope to find out how the energy from the stars will affect your individual zodiac sign. Happy Saturday, zodiac signs! Today’s daily horoscope is here! The day is set to be a sweet one! The Moon is in Aquarius, who loves new ideas and helping others. He’s all about trying out new things and breaking the rules. To add to tonight’s sweetness, Libra Sun is still with us, and now that Mercury entered Libra on September 29th, our attention turns from organizing our own things, and on to more messier things… like people! Now, that the Sun, Mercury, and Jupiter are in Libra, you can spend time sipping hot cocoa or your favorite non-pumpkin spice beverage while catching up with your friends. Haven’t called your someone in a while? Pick up the phone. Embrace some new opportunities.This is the season of expanding your network, getting reconnected, and there’s plenty of good fortune to go around for everyone! Check out today’s horoscope to find out how the energy from the stars will affect your individual zodiac sign. You will have enough time in hand today, so if don’t hesitate to dedicate some moments to your family, friends, or even be there for someone who might need your help. If you give up something to give it to others, in this case, just a bit of time, you will surely get a personal benefit, a cheerful mood, and feel that you have done something extraordinary. In short, a little gesture for a greater joy! The day will start a little differently than usual and you are not used to it. Your routine will be slightly upset but it will be nice as well. You will experience something new and could be even better than usual! If you love adventure, from this little occasion you may have other catapults elsewhere, which will give you new stimuli and maybe you will face something that you might have never experienced before. Don’t brag about anything today, not matter how good you are, you don’t need to show it. If you manage to solve a small problem, you will multiply your expectations and those of others around you. With little energy but so much rationality, any day could turn into a day to remember, especially from a professional point of view. That’s what could change the horizon. You have good learning skills so you should just push on this day, study or find information that will then serve you to accomplish your intentions or to achieve your goal. In one day you could incredibly make a break in your career or your love life, exponentially increasing your chances of success. It is not the only aspect you are interested in, but at least you can start from there! This could be a quiet, peaceful day without too much pretense but still socially interesting. You just have to be careful of a small detail: your restless character. In fact, a mood swing or a too vivid reaction could alter some affective or friendship relationships and could lead you to a whirlwind of excuses, disappointments, and rancor. Avoid it because you won’t be able to apologize later. Try to bring a little bit of a lump into your daily life because you’re overly flattened and haven’t been able to give a new fit to your programs. This weighs you and is a source of frustration, but you will not have to weigh over the others. What you should avoid is to give too much importance to people who are not giving you anything back at this time and therefore can’t have the same weight as those who are always present in your existence.